Before 1870, the area known today as Victorian Village today, was a series of farms on the northern outskirts of Columbus. One of the farms was owned by William "Billy" Neil, who was one of Columbus' early entrepeneurs. Neil had purchased his initial 300 acre farm in 1827 and over the years he added considerably to that initial purchase. Neil built a farmhouse near the center of his farm that was located not far from where University Hall stands today. To get to the house, Neil built a road from downtown Columbus out to his farmhouse. That road would later become known as Neil Avenue. By 1853, the Neils had purchased almost all the land west of High Street all the way to the Olentangy River and from downtown north to Lane Avenue which was the furtherest edge of the original farm. At about the same time, Dr. Lincoln Goodale donated some 40 acres of land just east of Neil's road, for the express purpose of becoming a city park. That park became Goodale Park and this was the beginning of what would later become known as Victorian Village. Over the years, William and Hannah Neil divided portions of their property among their children, but a large portion of the land was donated to the state in 1870, 2 years after William Neil died. The purpose for the donation was to create a school called the Ohio Agricultural and Mechanical College (later changed to the Ohio State University). As the school began to develop, a horse drawn street car was built from downtown out to the school along Neil Avenue. Neil Avenue became a major north-south connection. The increased mobility resulting from the rail line and establishment of the University opened the way for further growth. The area west of Neil and south of Fifth was platted between 1888 and 1902 for residential development and by 1920 the area entirely developed prior to 1920. The neighbor began as a mixed group of professionals, craftsmen and merchants. This wide social mix is reflected in the rich variety of architecture still found throughout the Village. Today, Victorian Village has some of the finest examples of domestic Victorian Era architecture in the country. In the late 1960s and 70s, a new interest in the area began to flourish and has continued as homes are being carefully restored to their original character. Victorian Village's history and architecture make it a unique and diversified area that can still accommodate a variety of income levels and social backgrounds. 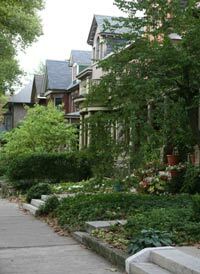 Each year in September there is a house and garden tour of the neighborhood, that has now been expanded to include homes located in the Short North and Victorian Village. This tour comprises an eclectic mix of 10 - 11 homes. Most of the houses feature complete building renovatons and restorations. 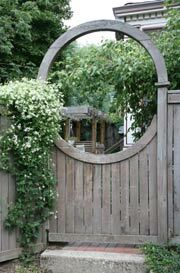 Usually on the 3rd Sunday in September is the Annual Short North House & Garden Tour.